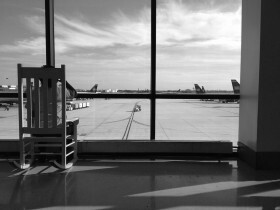 So I’m sitting in a rocking chair in Philadelphia airport staring out into the airfield. There’s a colony of them by the big window, all white, facing out to the horizon. Rocking chairs, that is. Travellers and staff on breaks sit and lap up the light like passengers on the rear deck of a liner. I have cleared immigration and have an ocean of hours to waste waiting for my connection, southbound and westward to Austin in the vast state of Texas. Behind us busybodies pass wittering on mobile phones. 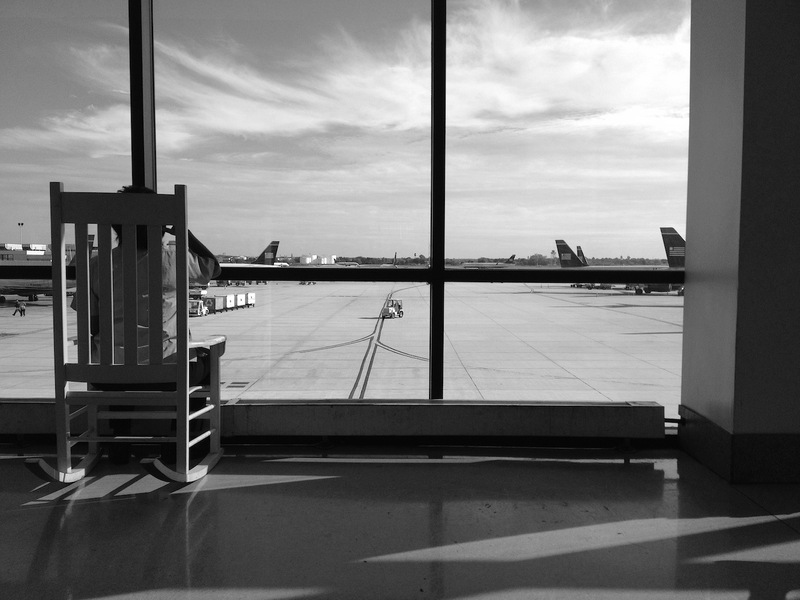 The polished floor reflects the motion of wheeled cases gliding across the concourse in a great waltz. Everybody has somewhere to get to with their cache of stuff, the same stuff in every bag. I am perfectly still for the while, apart from the occasional, comforting little rock. Aboard I watch from my porthole the baggage handler tossing luggage from a wagon onto our plane. He sports a dapper Isaac Hayes beard and wears his hi-vis tabard around his shoulders like a little cape. For some reason he loads my guitar last and it’s the only item he places onto the belt with any delicacy. Perhaps he’s one of us. During the flight I look across the aisle to see a woman poring over a large bible. It has those slivered page edges that denote the shining glory of the content. Her expression is very severe – and no wonder. It’s completely incomprehensible, the bible. I feel I ought to warn her it has a very nasty ending but God hates a spoiler. The sun sinks below the wooly purple strata with a final orange farewell and I turn my eyes into the godless pages of the New Yorker, that in-flight journal of the sanctimonious middle class. Full of smugness of every conceivable stripe it nonetheless kills the hours with its silky house-style and soothing font. Not very Texas, though. I’ll have to sort that out. Little scatterings of lights appear below the enormous night like patches of phosphorescent algae on a dark sea. Sailing above, the seahorse of the Plough presides sublimely in the western sky. Suddenly the ground is alive with glowing towns as far as the eye can see and Austin swims up like a dream through the twilight. I have been in transit for eighteen hours and I’m becoming little more than a thin layer of sweat encasing a dull heartbeat. My chain-hotel box sits by an Interstate awaiting my fresh bag of stuff with trembling air-conditioning, tiny bars of soap and a plastic tumbler wrapped in polythene like bagged evidence from a murder. Thank you for taking such care of the English Language in your writing, as in your songs. Why is sitting, rocking gently in a rocking chair so soothing? I eagerly await the next installment Sir. I hope the cape man is one of ours.